Is it possible to have a tanning lotion and be protected from the sun at the same time? In this article i will review the most sought after and the best rated outdoor tanning lotion available. These lotions have great reviews from people who have bought them. I distilled them in this article so you can choose the one who fits you the best! I have found the Hawaiian Tropic to be the best out of the top 4. If you are interested you can read the full article below! If you are not sure on what to buy you should read our buying guide at the bottom of the page. The Hawaiian Tropic sunscreen lotion is an exotic product perfect for tanning outdoors. Its ranking as the best choice for an outdoor tanning lotion is due to a number of reasons, one of them being its aloe vera enriched formula. The Hawaiian tropic lotion also contains antioxidants and other skin-nourishing ingredients that moisturizes the skin, giving it a healthy glow and a soft texture. One of this lotion’s unique selling points is its appealing scent. Labeled as having a classic coconut fragrance, the Hawaiian tropic sunscreen does not have the usual strong chemical smell of most tanning lotions and sunscreens. Its edge over another outdoor tanning lotion is also due to its waterproof feature. Unlike most lotions that must be applied before and after any water activity to prevent the risk of sunburns, the Hawaiian tropic once applied, absorbs into the skin and continues the tanning process even after vigorous activity in the pool or beach, or an intense gym workout. 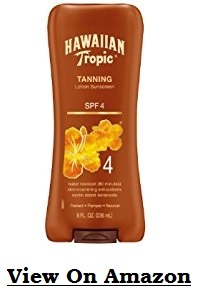 The Hawaiian tropic sunscreen is available either as an SPF 4 brand or as an SPF 8 brand. Regardless of the brand chosen, the fact remains that both sunscreen styles have extremely low SPFs. In other words, they offer little protection from the sun. Using only the Hawaiian tropic sunscreen lotion for sunbathing for an extended period of time would lead to severe burns. Thus, it is advisable to pair it with another sunscreen of higher SPF when sunbathing for a long time. An issue with this lotion is its inability to offer broad-spectrum protection from both UVA and UVB rays. It only offers UVB-screening protection, that is, it protects the skin from UVB rays only. Aside from its low SPF and limited protection problems, the Hawaiian tropic sunscreen is a great choice for outdoor tanning. As its name implies, it accelerates or speeds up the tanning process, making your skin dark in a very short time. If you have little or no tan, and seeking to build a base tan, then the Hawaiian Tropic sunscreen is just what you need. 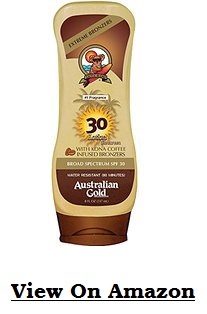 This lotion has a high SPF of 30, thus providing adequate protection from the sun while tanning. It also offers broad-spectrum UVA/UVB protection, shielding the skin against harmful UVA and UVB rays. The Australian Gold lotion has a distinct fragrance typical of all Australian Gold’s products. This is one of the rare lotions that enrich the skin with a large amount of Vitamin C.
The Australian Gold lotion contains bronzers made from Kona coffee. These bronzers give a natural and immediate golden color to your skin once the sunscreen is applied. This helps to give you a tan look once you step out into the sun to begin the tanning process. Simply put, the bronzers help you look tan while you tan. Most bronzers are difficult to wash off once the tanning process is over, but the Australian Gold lotion with Kona bronzers poses no such difficulty, as the color easily washes off in the shower. Unfortunately, this lotion does not accelerate tanning. It is quite expensive and the bronzer leaves visible streaks on clothes. The biggest problem with this lotion however is the harmful chemicals used in making it. It contains flammable materials and harsh substances that are injurious to human health. On the bright side, the Australian Gold lotion is water resistant, gives your skin a radiant sun-kissed color courtesy of its Kona bronzers and is the surest bet for preventing sunburn with its high SPF level. 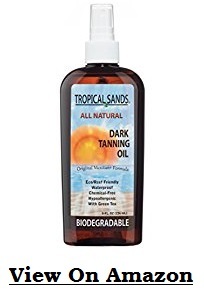 A one-of-a-kind product from Tropical Sands, the All Natural tanning oil means exactly what it says. It contains no harsh chemicals, emulsifiers or additional fragrances. Made from natural healthy oils, this exceptional product is a great recommendation for both indoor and outdoor tanning. It is virtually harmless to marine and aquatic organisms, and is environment-friendly, thus making its use acceptable in eco-nature parks. It supplements the skin with vitamins C and D, alongside other natural ingredients that nourish and moisturize the skin. However, this lotion has no SPF and as such offers no protection from the sun while tanning outdoors. Thus, for outdoor tanning, the All Natural tanning oil must be used with a sunscreen (preferably one with a high SPF) to prevent burning. Oils have a greasy feel, and this one is no exception. It gives a sticky feel and makes its application slippery and frustrating. It also leaves a white film all over the body once you are done applying it. Despite these apparent disadvantages, the All Natural tanning oil is a wise choice for those with sensitive skin or allergies, as it is labeled hypoallergenic. Thus, it is quite unlikely for anyone to sufffer any allergies. It also provides a dark, rich tan and is water resistant. Additionally, it comes in a spray bottle. This makes it quite easy to apply the oil to hard-to-reach parts of the body, such as your back. 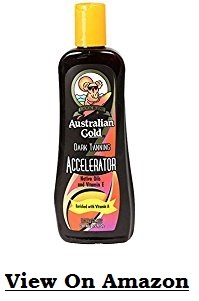 The Australian Gold Dark Tanning Accelerator is an exclusive lotion used for speeding up the tanning process with lasting effects. It can be used to get a base tan, if you are new in the tanning business, or to maintain a tan already acquired. This lotion can be used for both indoor and outdoor tanning purposes. It contains vitamins A and E, and native Australian oils that help to hydrate and moisturize the skin. Once applied, it absorbs into the skin and leaves no residue on the body. It is also quite affordable, compared to other tanning lotions. This lotion is purely a tanning accelerator, and as such, contains no bronzer. Therefore, the tan gotten from this product does not wash off while showering, but lasts for a long period of time. The major disadvantage of this lotion is its lack of water resistance. You have to reapply it once you get out of the water or risk turning lobster red. Just like the All Natural tanning oil, this lotion also has zero SPF, and thus must be used with an SPF sunscreen for outdoor tanning. It provides no UV protection whatsoever and is known to react and produce rashes when used on certain skin types and/or colors. On the plus side, it is neither greasy nor sticky, has a nice citrusy fragrance, gives an even tan, and works in any type of tanning bed. With the Australian Gold Dark Tanning Accelerator, you can quickly give your skin a rich, natural, and golden tan, either on a tanning bed or outside by the pool. Purchasing the right type of tanning lotion suitable for your skin and appropriate for your tanning needs can only be made possible if you have sufficient information. Knowledge is indeed valuable, and the contents of this guide would hopefully steer you in the right direction when searching for the perfect tanning lotion. What is a tanning lotion? A tanning lotion is simply a liquid applied to the skin to aid in the tanning process. A tanning lotion is quite different from a sunscreen or sunblock. While tanning lotions make use of the sun’s rays to darken your skin, the sunscreen’s primary purpose is to protect your skin from the harmful rays of the sun. There are a variety of tanning lotions with unique features out there serving different kinds of purposes. Though they perform roughly the same purpose, tanning lotions are quite different from tanning oils. Tanning lotions are mostly creams, while the tanning oils are oily, and most times, leave the user with a greasy feeling. Tanning oils usually come in spray bottles. Indoor tanning lotions are specifically designed to be used in tanning beds. They have virtually no SPF (sun protection factor) and as a result, offer little or no protection from the sun. On the other hand, outdoor tanning lotions are to be used in the sun, as they contain SPF and are guaranteed to protect users from the burning effect of the sun. It is wrong and harmful to use indoor tanning lotions for outdoor tanning purposes and vice versa, as doing so might cause skin burns or accidents in the tanning bed. However, some manufacturers have produced tanning lotions that are both safe for indoor and outdoor use. These tanning lotions have no SPF and users are cautioned to pair them with a sunscreen when tanning outdoors. This has always been a point of confusion for tanning lotion users. An accelerator does exactly what it says. It accelerates or quickens the tanning process. You get a nice dark tan pretty fast compared to using a normal tanning lotion. Bronzers do not accelerate the tanning process. They work just like normal tanners, but unlike normal tanning lotions, they give your skin a tan look when they are applied. The tan the bronzer gives you on application is not real and would wash off once you shower. What plays a role in the decision? Decision-making is no easy task. However, the factors below would help you decide on what type of lotion you truly need. Moisturizer: Tanning lotions with moisturizers make your skin soft and smooth even when lying under the hot sun. Personally, I recommend going for tanning lotions with moisturizers. Sun protection factor (SPF): The SPF of a tanning lotion indicates the level of protection the lotion can offer. Lotions with SPF 15 or higher are recommended as they offer greater protection from the sun than those with lower SPFs. Broad-spectrum vs Limited-spectrum protection: A tanning lotion with a broad-spectrum protection protects you from both UVA and UVB rays of the sun. These rays are quite harmful to your skin and health. The UVA rays promote skin aging and wrinkling while UVB rays are huge contributors to skin cancer. The limited-spectrum protection protects users from only the UVB rays. It is therefore advisable to choose a tanning lotion with a broad-spectrum protection rather than one having only limited protection. Skin type: This is a very important factor in determining the type of tanning lotion to buy. Some skin types are sensitive to some particular ingredients or chemicals used in tanning lotions. You must know what works best for your skin color. Do you tan easily? Are you more prone to burning in the sun? Answering these questions would help you decide properly. For people with sensitive skins and/or allergies, buying a natural or hypoallergenic tanning lotion is the safest bet. Accelerator vs Bronzer: This depends on your tanning needs. If you want to quickly build a base tan, then start with an accelerator. If you want to maintain your tan, you can continue with a darker accelerator or go for a bronzer. Additionally, if you love looking tan while tanning, then the bronzer is just for you. Waterproof: Tanning lotions that are not affected by water or sweat are strongly recommended if you like a little bit of water sport while out in the sun. Fragrance: This boils down to your taste and preferences. Almost everyone hates chemical-smelling lotions. Some people love the coconut fragrance synonymous with most tanning lotions. Others find the smell nauseating and prefer natural lotions with no odour. Quick Safety Tip: Always remember to apply the lotion to your ears, knees, elbows, and calves. Wear sunshades and hats to reduce the risk of getting sunburnt.